A dramatised walking tour of Derry Walls devised by a University of Ulster lecturer that interprets the pivotal role played by woman in the city’s history has been getting rave reviews. ‘The Maidens' City: A ‘Herstory’ of the Walled City’ is the brainchild of University of Ulster Media lecturer and award winning filmmaker, Anne Crilly. Using the 17th century walls as a theatrical backdrop, the tour is a creative collaboration with locally based theatre group, Sole Purpose Productions, which tells the largely hidden history of women in an energetic, engaging and entertaining way. “It’s history but not as you know it,” said Anne, who first developed the tour a few years ago as a one-off celebration to mark International Women’s Day. 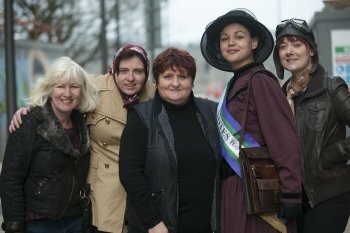 The tour proved such a hit with locals and visitors alike that this year, the dramatised tour was offered twice daily throughout International Women’s Week as part of The UK City of Culture 2013 programme. The theatrical journey starts at the Guildhall where local Suffragettes met 100 years ago before winding its way along the Walls. The walk focuses on the bravery and determination of key female characters and events that helped shape the history of the city: from the feisty aviatrix, Amelia Earhart to the tragic Cecily Jackson, the teenage mother burned at the stake for infanticide in 1725. University of Ulster drama graduates took centre stage for the production. The tour guide/narrator is Abby Oliviera who plays the role of Derry based Suffragette, Margaret Cousins. She was a grand aunt of Derry GP, Dr Keith Monro and went on to become the first female Magistrate in India. The other parts are played by another drama graduate from Ulster, Nicky Harley and Gemma Walker who studied drama in Birmingham. Anne, who lectures in the School of Media Film and Journalism at the University’s Coleraine campus, explained how The Maidens’ City evolved from a research project in the Centre for Media Research and her abiding interest in the media representations of women.“The Maidens’ City’ is a gendered narrative which interprets some of the key events in the city’s history from a feminist viewpoint,” she explained. “I have been on several of the tours offered in Derry, and while good, they did not offer me the history I knew was there and was most interested in. As I researched and uncovered archival material and the lost histories of women, I decided to present the research initially as an alternative tour." She continued: “Performance presents research findings in an innovative way that makes the information both accessible and more appealing to a wider audience. “I really enjoyed writing this dramatised tour as a site-specific piece of theatre and it was a great experience working with an experienced director like Patricia Byrne and such accomplished actresses." Anne, who has received international critical acclaim for her award winning films which include ‘Mother Ireland' for Channel 4 and ‘Limbo’ for TG4/Irish Film Board, added that the dramatised walking tour will be filmed and integrated into her future documentary practice lectures. She is currently working on ‘The Angel Trail’, a documentary about the creative expression of grief. The Maiden’s City is produced by Patricia Byrne, Artistic Director of Sole Purpose Productions and other University of Ulster alumni. She holds a BA (Hons) Drama and an MA in Media Management from the University of Ulster. Pat explains how the dramaticised walking tour evolved. "I had been on Anne Crilly's women's history walking tours of Derry a couple of times and thought it would make a good theatrical tour,” she said. “I approached Anne with the idea and she was interested. I then applied for the funding to Derry City Council and the City of Culture and went about making the production happen. It has been a great success and has appealed to all sections of the community. It is great that the Media Research Centre has supported this production," she said.